Young Hercules was a 30 minute fantasy series on the FOX Network about Hercules' life as a teenager. 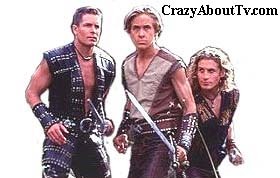 Together with his friends Jason and Iolaus, they learned about life and experienced many adventures. Fans of Hercules got to see how he was trained to be a warrior and how his relationships with his friends and his family of Gods developed! Ryan Gosling got his first big break in show business when he was accepted as a member of the "Mickey Mouse Club". Ryan's nickname is "Opie" and he is a very good jazz guitarist. After Young Hercules ended, Chris Conrad returned to school and got his college degree. He then became a teacher and a coach at his alma mater in Florida. Dean O'Gorman got his black belt in Karate at the age of 10 years old! Kevin Smith played in several rock & roll bands both before and after "Young Hercules". He didn't ever pursue acting as a career. His wife heard about an open casting call for a musical and signed him up! He got a part and was even made understudy for the lead part! Unfortunately, Kevin fell from many stories high (some witnesses said six stories) died 10 days later. The accident happened on February 6, 2002 just one day after he finished taping on a video release, "Warriors of Virtue II (2002)" in Beijing, China. Young Hercules was filmed in Auckland, New Zealand. "In an age of light and darkness, Zeus, King of the Gods ruled the universe. He had a son. Young Hercules. Half-god, half-man, young Hercules longs to find his place in the world. The father he's never known and what it means to be a hero. Before the man became legend, before the legend became myth, came the greatest adventure of them all." Thank you for visiting our Young Hercules page!